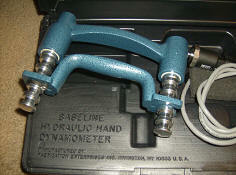 Handle Adjustment Five Positions - 1 3/8" to 3 3/8"
Quantitative Muscle Assessment, "QMA" and LifeForce are trademarks of James R. Fielding. Copyright 1996-2009 AEVERL MEDICAL, James R. Fielding. All rights reserved. Last modified: Tuesday June 07, 2016.